That orange plastic will go when landscaping is installed. You can quit worrying about fancy embellishments at the roundabout completed last year on Albany’s Main Street. The advisory board of the Central Albany Revitalization Area Wednesday unanimously accepted a staff recommendation to spend no CARA money on the place. 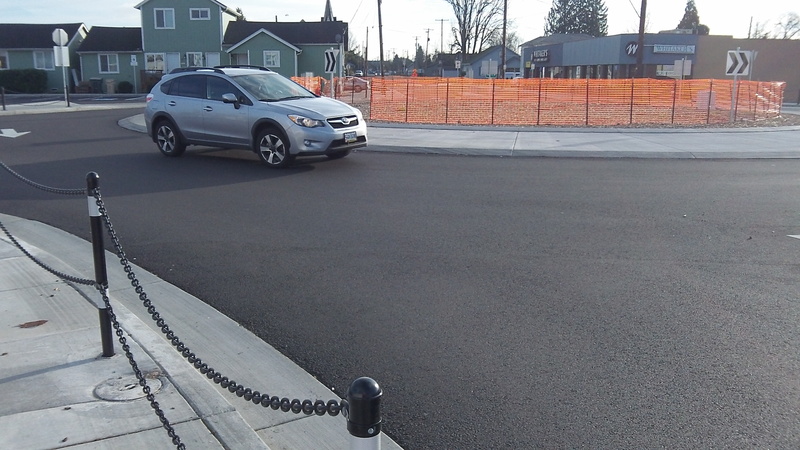 As a result, the center island will get simple landscaping similar to that on the traffic circles on North Albany and Knox Butte roads. Kate Porsche, urban renewal manager and economic development director, told the board the nearly $130,000 cost of previously proposed features — a circular wall and wrought-iron fence along with signage — was not worth the benefit of these additions. Her message: If CARA wanted to spend that amount, there are other ways that would do more for the Main Street neighborhood. Councilor Floyd Collins suggested that for him, the subject was now closed and he would not want the board to change its mind some months down the road. My pacemaker just went ballistic. Common sense has prevailed? Praise God. If you’re looking at the other side of a modern roundabout when you’re entering, you’re driving unsafely. Drivers entering a modern roundabout should first look for pedestrians, then watch for other motorists approaching their entry, and then watch for pedestrians when exiting. The motorist on the other side of the circle won’t get to you for 5 or ten seconds. Obscured views across the central island is one of the safety features. The smaller size of properly designed modern roundabouts is what makes them safer and keeps speeds in the 20 mph range. This makes it much easier to avoid a crash or stop for pedestrians. It also means that if a crash happens the likelihood of injury is very low. Safety is the #1 reason there are over 3,500 modern roundabouts in the US today and many more on the way. Modern roundabouts are designed for trucks, large vehicles, and trailer towing vehicles by including the center flat area around the circle. It’s not a sidewalk, it’s called a truck apron, and it’s for trucks to begin a sharp right or end a left or U-turn on.